Update: This recipe has been entered into the “Balanced Breakfast Meals” contest over at the Fun and Food blog. I was never much of a baker, it’s a very foreign cooking method to me. I don’t know enough to add/change ingredients and certainly not enough to create my own recipe. Not to mention that baked products generally aren’t very nutritious, mostly just empty calories – tasty calories, but empty nonetheless. The Banana Blueberry Bran Muffins came out very good but the recipe was directly from Farmgirl Fare. And being the peanut butter boy I wanted to incorporate peanut butter into a muffin recipe but had no idea what to replace it with. I have a problem with wasting food and I would hate to throw out a batch of muffins that didn’t turn out. As a good example, you should see my empty peanut butter containers, they are immaculate as if they were ready for filling at the peanut butter factory. To me, there’s nothing worse than a messy peanut butter jar. Well I decided to bite the bullet and experiment by working with a flavor combination that my mother discovered and anyone who has since tried it has fallen in love: the combination of peaches with peanut butter, cinnamon and raisins. Discovered in the early 21st century during the peanut butter era (summer 2007 to be exact), this delectable combo was founded in the form of a sandwich, now called The Linda Delite (recipe soon). It may sound strange at first but let me say that this toasted sandwich has since replaced the traditional grilled peanut butter and banana sandwich for me. 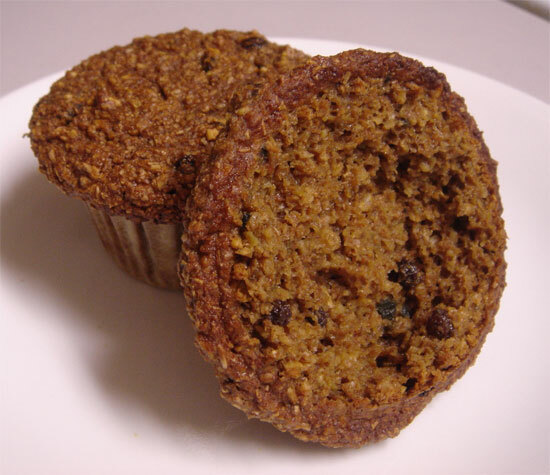 Using this flavor combo, I heavily modified the basic bran muffin from the above site. All oil has been removed and replaced with peanut butter, along with the addition of peach puree and peach applesauce. 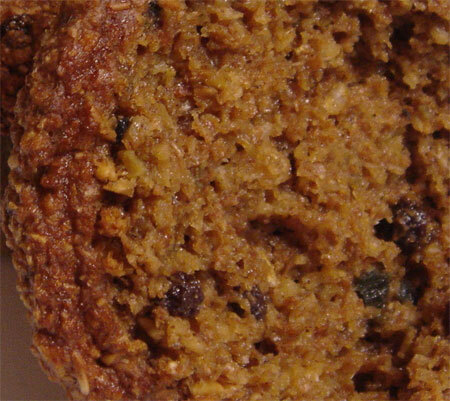 This is one muffin you don’t want to miss. 1. Heat oven to 375. Spray 2 standard size muffin pans or use paper liners (best choice). If you don’t have two muffin pans, you’ll have to make two batches or cut the recipe in half. Combine dry ingredients in a large bowl and mix well to coat the currants. 2. Cut peaches in half and remove pit. Place in a blender with the applesauce. Pulse until pureed. Combine peach puree and remaining wet ingredients into a medium-sized bowl and mix. Pour wet ingredients into dry ingredients and gently mix just until combined. 3. Spoon batter into muffin cups and mound as high as you can without spilling over the paper liner. Bake for 26-28 minutes or until a toothpick comes out clean (but moist). Makes 14-16 large muffins. The only thing a little high is the sugar, but it mostly comes from fruit, honey and molasses. Feel free to reduce sugar amounts to your liking. Enjoy these perfectly moist muffins! Hmm that seems like a yummy combination. . . cinnamom raison peanut butter peach. lol. Do these come out to roughly the same size as the Trader Joe’s muffins? Yup, very similar in size! Maybe not quite as tall….